The BLÜ Group - Advertising & Marketing Develops Guide to Help Small and Mid-Sized Businesses Understand Facebook, Twitter, LinkedIn, Foursquare, Yelp, and Other Key Social Media Outlets. Free Social Media Guide. Download Today! The BLÜ Group – Advertising & Marketing has published a free social media guide to help businesses of all sizes, particularly small and mid-sized businesses, connect with customers and potential customers, stay engaged with them, and ultimately grow their bottom line. 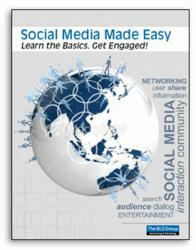 This 41-page guide covers Facebook, Twitter, LinkedIn, Foursquare, Yelp, Groupon, and Living Social. “We created this guide for people that may have a basic understanding of social media, but still had questions about how to begin using it effectively" said Tony Roberts, president and brand-builder at The BLÜ Group. “Social media, the various options, and how to make it work best to help grow a company's business and strengthen their brand can be very intimidating for some. We hope this guide helps them get started in the right direction." Despite what some may think, social networking is not new. Social networks have been around for far longer than people have been online. Everyone has belonged to social networks, and they still participate in social networks whether they know it or not. This social networking guide will help businesses and individuals understand some of the most popular social networking sites and lay the groundwork for a successful social media program. Download Your Free Guide Today. About The BLÜ Group – Advertising & Marketing: The BLÜ Group, based in Onalaska, WI, is a full-service ad agency focused on doing whatever it takes to strengthen their clients’ brand and grow their business. They specialize and employ a wide range of disciplines that approach their clients’ marketing challenges from many different fronts. These include: Market Research, Brand Platform Development, Marketing Strategies, Broadcast and Print Advertising, Graphic Design, Corporate Identity, Direct Marketing, Website Design, Website Programming, Media Planning and Buying, Search Engine Optimization (SEO), E-mail Marketing, and Social Media. For more information visit TheBLUGroup.com or connect with them on Facebook and Twitter.